So you’ve decided to forego the need for a safety razor, straight razor or Electric Razor and go down the path of becoming a bearded or stubbled gentleman by picking the best beard trimmer that you can find. Let’s face it – if you can grow a full fledged beard, growing it out is a right of passage for any guy. The problem is that if you don’t take care of it, you can end up looking like a homeless guy and not scholar. You need to make sure you have your beard trimmed appropriately, especially if you are in the business world so you don’t look like you just crawled out of a trashcan. Here’s where we’ve done the hard work for you by picking out the best beard trimmers on the market to highlight the benefits of each. You can take a look at the comparison grid below for user reviews, price expectations and much more. We’ve also broken out all 10 of them in much more detail at the bottom of this article for an in-depth look at each. So now that you’ve looked at our top 10, let’s look at why having the right beard trimmer is an absolute must for any dude with some fuzz and break each of these models down into further detail. It’s obviously extremely important if you are in a professional job where presentation to clients and/or superiors matters to the future of your career. You want to make sure that your beard doesn’t have you looking like this guy below, so having the right trimmer to give you the professional look you need is a must. Check out the Quick Jump Menu Below if you aren’t sure where to begin. • Keeps your beard looking professionally manscaped. • You can use it on your head as well in most cases if you like to keep your hair short. • Beard Trimmers are easy to transport with your business attire. • You won’t look like Grizzly Adams. • You can still look professional with the right trim & beard style. So after checking out our top 10 comparison guide, maybe you’ve narrowed it down to a few of your favorite choices but still aren’t sure which model is the perfect one. Fear not & continue on. Below we get a little more granular and break out the exact details of the top 10 models in our comparison chart so you can have all the details you need around price, function, portability and quality. So without any additional delay, let’s jump right into our Top 10 selections and why we think they are the top options if you are looking to give your beard or mustache a quick trim. The Philips Norelco tops the list as an Amazon.com bestseller with thousands of reviews. It’s pretty much the only trimmer on the market that has a vacuum system that pulls away the hair as it shaves so it doesn’t dump all over your sink. This makes it not only an ideal selection for those of us that are neat freaks, but also anyone that’s not looking to end up like this guy (watch at your own discretion) when shaving other areas of your body outside your face. It comes equipped with multiple length settings, comb that is fully adjustable and even button that offers a “turbo boost” function which increases cutting speed for those of us in a mad dash to get to our next location. The 7300 also features a multi functional display, ½ mm stubble setting which caters to those of us (including myself) that wear that 4-5 day unshaven look. The final icing on the cake is that this shaver rocks both a cordless and corded function making it great for travelers. 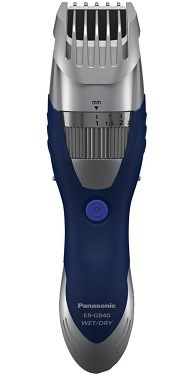 It also has 16 length settings to ensure that this mustache and beard trimmer really is a “one size fits all” solution. Next up on our list is the Panasonic ER-GB40. This one weighs in at #2 for matching the Norelco QT4070 in the fact that it is cordless, but it reaches one further being something you can use in the shower as well. Panasonic doesn’t have the same clout that Norelco does as a specific manufacturer of shavers (Panasonic covers thousands of other electronic product lines) but it does a great job competing with the bigger more experienced grooming companies. The ER-GB40 makes for a great shower companion as well as when you are toweled off and getting ready for your day. The blades are Hypo-allergenic and it carries 19 settings of adjustable length depending on how tight you like to keep your stubble to your face. Not going to lie, I always trim my facial hair dry, but I can see a huge use for this if you travel a lot and need to minimize the time you spend doing daily tasks like grooming. It’s a pure matter of convenience. The main area that the Panasonic ER-GB40 lacks when comparing to the Norelco is that the Norelco pretty much cleans up after itself when it’s being used as a dry trimmer. If you prefer a wet trim, then the mess won’t matter and the ER-GB40-S is an absolutely solid choice that you can’t miss with. Please Note: The Panasonic is a great choice if you like to trim other hairy areas on yourself (we aren’t talking about your face) when you are in the shower. Just sayin. 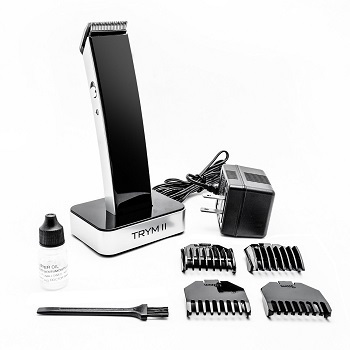 The TRYM II is somewhat of a newcomer to the contender list when comparing the top trimmers for the money. It runs about twenty bucks cheaper than some of the other well-known brands out there. One of our favorite things about the TRYM II is that it’s not an absolute eye-sore like some of the other more traditional models that have been around for a while. It has a much more modern design that actually make it look halfway decent in your bathroom. The downside of the TRYM II is that it only has four attachments. This means you can really only get 5 different lengths depending on the type of facial hair you plan on growing. For most people this is more than enough, but if you are one of those people that likes to keep your options open, we’d suggest looking at one of the other models that we’ve already reviewed on this list. The OSTER Fast feed is a corded clipper. If you need wireless dry trimmer, just save yourself the time and jump back up to the Norelco QT4070 and click over to Amazon & make your purchase. If you don’t mind using a Beard/Moustache trimmer with a cord, then the Fast Feed is an awesome option. Not just because it can keep your facial hair in solid shape, but because you can use it for haircuts as well. The OSTER Fast Feed is a popular choice amongst professional barbers and hairstylists. Unlike the others on the list, the OSTER will require regular maintenance and oiling to keep it running like a champ. 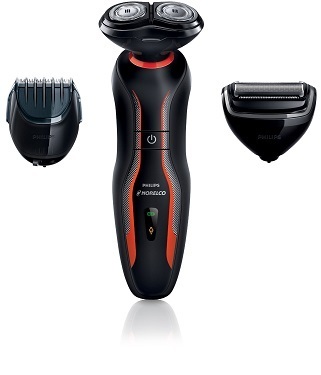 The benefit of this is that the blades are self-sharpening and the trimmer itself is designed for all day use. It cuts through both wet and dry hair and as long as you keep it properly lubricated, it should never rust. The OSTER is geared towards more commercial application but it makes an absolutely awesome companion if you are someone like me that pulls off the 5 day stubble look both on your face and on your head. Rounding out the top five is the Philips Norelco Multi Groom Plus. What we like about the Multi Groom is the fact that it covers so many aspects of your shaving needs. It comes with guards to clip your facial hair, nose hair trimmer extensions as well as guards to give you a haircut if you are DIY haircut type. The Philips Multi Groom is water resistant which makes it a fantastic option if you like to shave right after you pop out of the shower. It also operates both as a corded trimmer as well as a cordless trimmer which makes it great if you are on the go. We’d probably call the Multi Groom a “jack-of-all-trades, master of none” because there are other trimmers that we like a little better for trimming your facial hair, and there are also others that we like better to trim your actual hair. But for the money, if you are looking for a great option that covers everything in one, you won’t get more bang for your buck than the Philips Multi Groom. 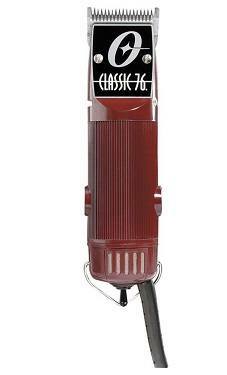 The Oster Class 76 is a top end shaver. It’s utilized mostly by professional hairstylists and barbers to cut hair. Little known fact is that high-end hair clippers actually function amazingly well as beard and mustache trimmers. Beard hair is more coarse, thicker and harder on blades than the hair that grows on your head. So why not get the top equipment out there to handle the toughest & dirtiest job? The Class 76 comes with multiple attachments and can cut at single lengths. If you are the type of person that likes to cut both your hair and your facial hair at the same time, the Class 76 is built to literally run all day. You won’t feel the trimmer start to lose juice or start to falter halfway through your trim job. The only thing that the Class 76 misses on is the fact that it doesn’t have a cordless option so this isn’t the choice you should make if you are looking for a travel companion. If you plan to use your beard trimmer to clip any other hair outside the hair on your face, we’d highly recommend the Class 76 purely on the durability and that you can get the most longevity for your money if you can handle the fact that it has to be plugged in. Water resistant, made for all day use and proven by barbers across the world, the Oster Class 76 is an absolute beast and you won’t be unsatisfied with the Purchase. 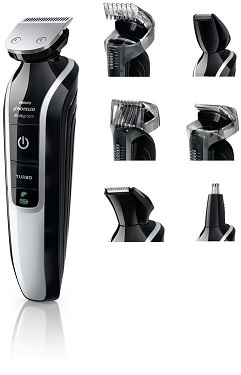 The Philips Norelco 3500 Beard Trimmer is quite possibly the top option on this list for anyone looking to stick to a budget of less than 40.00 for their trimmer purchase. It’s smaller size and cordless functionality make it a fantastic travel companion. The Norelco 3500 operates well with 20 different settings to give you plenty of options to choose from when determining the length to keep your beard or mustache. It has 90 minutes of battery life (cordless) and has titanium self-sharpening blades that make maintenance an absolute breeze. It has secured settings, so once you lock it in to one of the 20 choices, it won’t move around like some of the other beard trimmers on our list which gives you a more even trim. The only area that it falls short in is the fact that it’s not a wet shaver and it’s not meant to shave wet hair really at all. I’d recommend that you plan accordingly if you plan to own the 3500 so you can ensure that you get your trim in before you hit the shower if that’s something that is important to you. The Old Spice Beard & Head Trimmer by Braun is Braun’ answer to the Beard Trimmer 3500 by Norelco. It’s cordless, cheap and efficient. While it falls short of the Trimmer 3500 with only 12 fixed settings, it still holds up to our expectations and provides ample amounts of choice for those looking to test the different lengths of facial hair. It’s also a great all in one option for those looking to keep their hair on their head nice and tight. 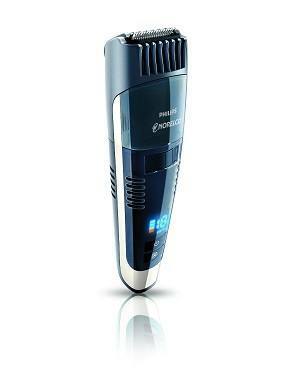 When it comes to reliability, this trimmer has been rated extremely reliable by most people that have made the purchase which is a good considering the amount of abuse most beard trimmers go through. One of the primary features of this model is the fact that it has TWO attachments, not several, making this an excellent trimmer for those that like to travel light. It’s also fully washable which is great on the go when you want to just toss it under the faucet for a rinse and go. Overall the Old Spice Beard & Head trimmer is a great choice for anyone on a budget looking for a quick solution to their facial hair cutting needs. With stainless steel blades and 5 adjustable attachments the Wettech seems to lack in options with comparison to some of the other trimmers on this list. That’s not the full story. What it does have that the others do not is a body shaver attachment that will help you groom your body hair if you are someone that likes to keep other hair trimmed on your torso, legs (yes some dudes like to trim leg hair) or even “down there”. The body hair attachment also helps you shave your body hair no matter if you are wet or dry which makes it an extremely convenient option. The lithium ion battery gives it an extended cordless life span, which will help you keep it active for up to 60 minutes on one single charge. Overall the Wettech is a great option over the others if you are looking for something to keep your facial hair and body hair in check without breaking the bank. The Philips Norelco Click & Style Shave Toolkit is great for someone looking for an all in one solution for every shaving situation. This shaving kit is probably the top choice for anyone that is looking for something that will cover everything from trimming a beard to a quick body trim or a full-blown wet shave in the shower. There are other options to choose from if you are looking to include hair-cutting solutions, but this model is ideal for those looking for an all in one package including shaving with an electric shaver. While it doesn’t come with the full fledged features that some of the other electric face shavers may cover, it does a good job coming close as another shaving tool that covers almost every base for a quick and efficient combo package. While there are others on this list that have sold more, the Click & Style Shave Toolkit is just one other viable option that you might want to consider when looking at your shaving needs. We’ve covered a lot of content and a lot of information here in this article to help you try to figure out which of these top beard and mustache trimmers will work best for you in your personal grooming situation. It doesn’t matter if you have more hair than a Wookiee or if you have problems growing a full beard, you still want to make sure that you look your best every time. The bottom line is that no matter which one of our top 10 picks you end up with, we are confident you will be very happy with your selection due to the overall quality of each beard & mustache trimmer on our list.